The decision to call a Special PRCB (Program Requirements Control Board) meeting on Tuesday paid dividends, as several outstanding issues gained the required flight rationale – with all dissenting opinions removed – to allow for Friday’s Agency-level Flight Readiness Review (FRR) to give a “go” for STS-131 to proceed towards an April 5 launch date. Nominal processing is continuing at Pad 39A, as engineers complete the integration of the payload into Discovery – prior to a weekend lull in work due to the smooth flow and contingency that remains in the path towards launch. “OV-103 / ET-135 / SRB BI-142 / RSRM 110 (Pad A): Payload electrical connections were completed Thursday. Payload Interface Verification is planned for today. Orbiter Aft Compartment closeout for flight continues. Pre door installation Aft Confidence Test began last night and continues today,” noted Friday processing information from the NASA Test Director (NTD). Two cracked tiles on Discovery are likely to be repaired by special solution known as RTV. Evaluations will continue on the size of the cracks, as any repairs will have to ensure they are waterproofed to protect the sponge-like tiles against any rain at the pad. The only other item of interest noted on Friday’s NTD report related to the “Payload Bay Door hinge line ceramic insert engineering evaluation and flight rational development,” which at the time (Friday morning) was still in work. This – along with the Right Reaction Control System (RRCS) helium isolation valve problem – both gained the required flight rationale at Friday’s Agency FRR at the Kennedy Space Center (KSC), clearing the way for Discovery to proceed towards an April 5 launch date. The potential issue with the small inserts was first noted during STS-130, when on orbit photography was reviewed by the DAT (Damage Assessment Team), which observed one of the inserts near Windows 1 and 2 of the flight deck to be protruding. Eventually cleared for entry, the insert actually remained in place – although a large amount of work had taken place on the ground to understand the risks involved with the insert liberating during entry and landing. “On-orbit Protruding Insert: During on-orbit inspection, a tile ceramic insert was found Pre STS-130 protruding ~0.4” between windows 1 & 2. Insert remained in place, but was easily removed when evaluated by engineering team during post flight inspection. Evaluation of closeout photos showed OML (Outer Mold Line) void growth,” noted a Special PRCB/FRR presentation (L2). “Inspected forward tile location for voids exceeding allowables. 12 discrepancies noted – 5 dispositioned as acceptable (via MR (Material Review) for minor voids w/ good pull test) and 7 were replaced. With a second insert also found to be protruding – albeit only slightly – engineers set about checking other inserts on the fleet. However, given the inserts are located everywhere that a panel or large part – such as the OMS pods, FRCS (Forwards Reaction Control System), etc. – is installed on the vehicle, the task was by no means a small one. “Multiple locations around windows, payload bay hinges, FRCS, and crew hatch found to not meet clearance requirement due to specification and drawing deficiencies (144 total tiles: 6 FRCS, 8 crew hatch, 68 PLBD, and 62 Window),” added the presentation. “Document out of tolerance clearance locations. Document indications of hard interference. Document locations that the plugs have been modified beyond drawing requirements. And one more problem was noted, specific to STS-131’s FRR, the issue of not being able to access the inserts on Discovery’s Payload Bay Door (PLBD) hinges, given the vehicle was out at the pad. “Ground Operations unable to access OV-103 (Discovery) payload bay door hinges at pad,” as the presentation noted, meaning if engineers could not gain an acceptable understanding of risk, flight rationale would become a problem, along with any call for inspections – which would have resulted in rollback to the Vehicle Assembly Building (VAB). In order to support flight rationale, without the need for hands on inspections of Discovery’s PLBD hinge inserts, Endeavour and Atlantis were inspected. Several pages of the 32 page presentation reviewed the status of Discovery’s sisters and found no issues of concern. Also, engineers evaluated the risks associated with one of the inserts liberating from this area of the vehicle, and what damage could be caused. Those findings showed the OMS Pod would potentially be in the line of fire. “Stress analysis performed to assess damage potential to TPS and Structure. Potential for OMS pod damage. Exceeds TPS on-orbit inspection criteria for all ascent and descent cases. Potential for thru hole and structural damage for some ascent and descent cases from both release location,” the presentation continued. While it was shown that despite the small mass, the energy would be sufficient to damage the structure, the key information related to the history of these inserts liberating from this specific area of the orbiter – and other at risk areas – which was shown to have never happened before in the history of the program. “Likelihood of liberation from PLBD hinge location: Historical insert failures for identified locations limited to Window locations. No flight failures found for PLBD hinge line, FRCS, and crew hatch,” added the presentation. 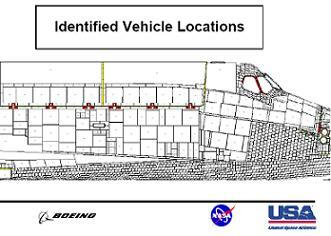 “OV-103 (Discovery) PLBD carrier panels have not been accessed for a minimum of 5-7 flights. 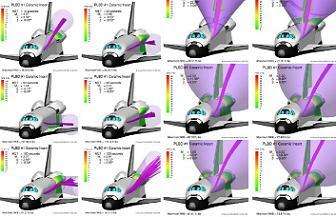 Loads study show pull test loads exceed flight loads when interference in not present. 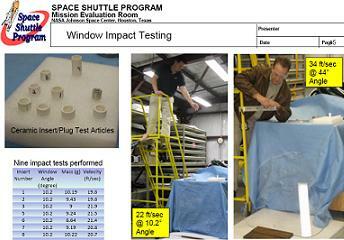 Flight loads for both window and PLBD locations with interference are exceeded by pull test loads. Pre-load due to insert interference has potential to exceed pull test loads. “Insert Inspection: Total of 317 Insert Pull Tests Completed. 1 pull test failure/1 Loose Insert on OV-105 (Endeavour) PLBD. No pull test failures at locations with identified interference. This in turn led to the flight rationale status, noting that while resulting damage had the potential to be catastrophic, the chance of it occurring was remote. 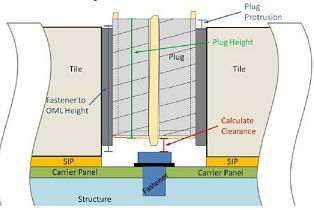 “With the exception of the OV-103 PLBD, Ceramic inserts with fastener interference have been re-baseline by pull test. Interferences have been eliminated during re-installation of the plugs. Assessment of the likelihood of release from the PLBD evaluated. Although the identified interference of the plugs with the fasteners was found to be an increase in risk, the overall likelihood remains at remote. With managers agreeing the risk was remote, approval to fly as-is was granted without any dissenting opinions.